Sunday June 1 it rained. I was in Carlisle, England, and I was disappointed. I had really wanted nice weather to get good photos of the cathedral east end. Instead I got bad photos of the cathedral east end. And despite my umbrella my shoes got soaked up at the Roman fort of Birdoswald while I was sightseeing along Hadrian's wall. However, the Day of Gloominess had its compensations. 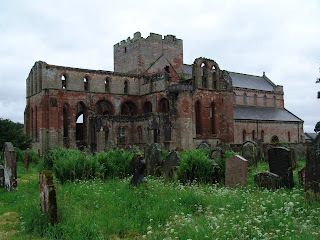 I stopped off to see Lanercost Priory, and am I glad I did! 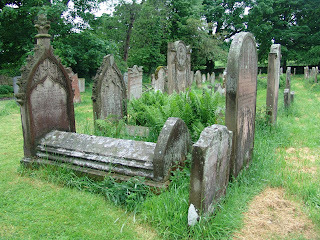 Look at the lush green ferns in the churchyard! Look at the cool tombstones! Some of them were practically the size of a single bed headboard. Taller than me, some of them! 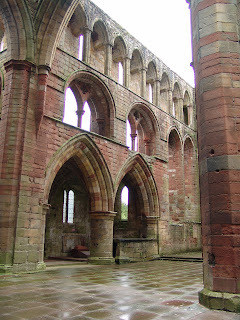 This is the ruined church choir (13th century Augustinian priory). 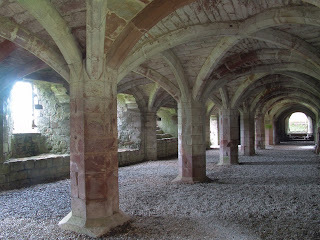 And to ice this architectural cake, the refectory undercroft survived (part of the monastic complex) with a really lovely rib vault, as fine as the undercrofts at the more celebrated Fountains Abbey.